Claim Your Bet 5 Get 30 Now! Even after 65 years the constantly pioneering spirit of BetVictor’s founder, Victor Chandler, is carried over and represented through BetVictor and its commitment to technology, showing a will to satisfy each and every customer. Because of that Victor Chandler is known as "The Gentleman Bookmaker", because of his willingness to offer a straight deal for your money in a civilized manner appropriate for a big sports betting brand as BetVictor. This sportsbook gives an array of betting opportunities across all major team and individual sports, especially for football, but for other sports too, such as horse racing, golf, tennis, greyhound racing, NFL, NBA, NHL, and their college levels of competition. If this is what you were looking for, than you will enjoy your visit at BetVictor. If this introductory text is not enough to make up your mind, then take a look at BetVictor’s sign up offer. BetVictor offers a free bet as a reward for your first bet. Place your first bet of £10 or more on a selection with odds evens or better and BetVictor will match it with 5 x £10 Free Bets and £10 Casino Bonus. There are no wagering requirements attached to the Sports Free Bets, but the £10 Casino Bonus is subject to 40x playthrough requirement. In addition to the explanation above on how to claim the free bet offer, we would like to mention that your first bet must be placed within 7 days from registration, or the offer will expire. Combined odds of evens or greater do not help you make a qualifying bet, unless it is fourfold or greater. In that case there is no minimum odds requirement. Once your bet has settled you will have the free bet available for use in no time. You have to use it in 30 days from issuing or all free bet funds will be removed from your account. Your free bet amount has to be placed in a separate bet slip, and that bet slip cannot contain any real cash bets. Claiming this free bet offer begins with the first step of registering your BetVictor account. 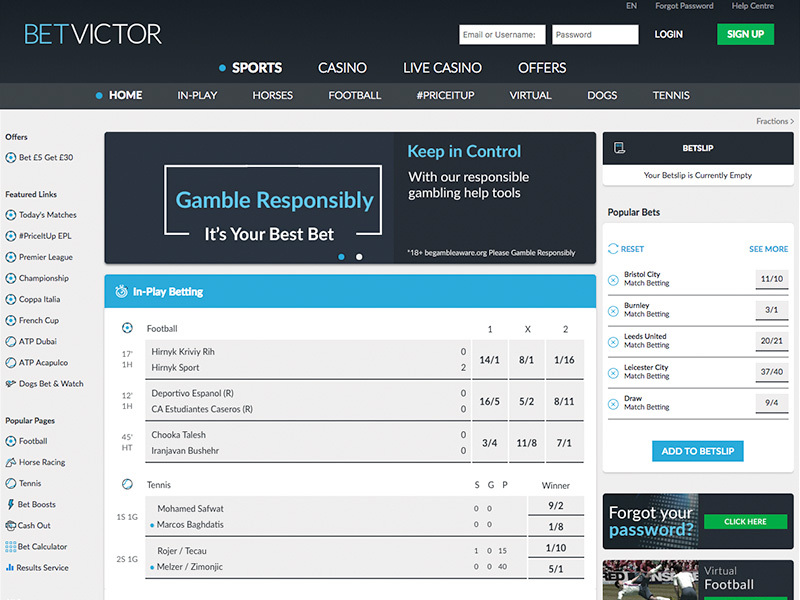 To do that you can visit the BetVictor website by clicking on our banner which will lead you directly to the site. BetVictor offers a quick and easy registration process that will not take more than a minute. Fill in the mandatory fields in the registration form, but do not provide incorrect details since it may interfere with your subsequent use of BetVictor. The successful registration process is followed by depositing. To make your first deposit select one of the many payment methods offered at BetVictor, and make minimum deposit of £5 or more. Your funds should be available in no time. Once you are able to use them, you can start playing for the free bet offer. 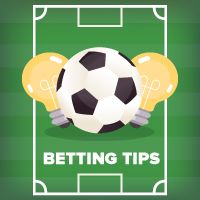 To make a qualifying bet your first bet must be £5 and contain a selection with odds of evens (2.00) or greater and BetVictor will award you with £30 worth or free bets. The story of the Victor Chandler betting business goes back to 1946, when Victor Chandler senior created the company that we today recognize as BetVictor, and only couple of years ago as just Victor Chandler. In 1975 the current Victor Chandler owner took over the business, and began leaving his impact on the betting industry with rapid expansion and series of pioneering moves. Today BetVictor has over half a million customers in over 160 countries and rising. BetVictor is licensed by the Government of Gibraltar, and in addition to betting services it offers separate pages for casino and poker playing too. BetVictor, previously known as Victor Chandler, has been around for over 60 years. During all that time this company has offered some great betting opportunities at strong prices, a legacy continued even today with the online sportsbook. You can find nice betting tools, such as the Live Diary that gives players a nice overview of scheduled live events. Also, you can place bets via your mobile and use it to place football bets in the extensive in-play service. BetVictor offers live streaming service for many Premier League fixtures, making it extremely suitable for football lovers, along with streams of all UK and Irish horse races. There aren’t many sportsbooks that offer Asian handicap football betting better than BetVictor. This is a result of Victor Chandler’s venture into the Asian market, making his company the pioneer in Asian handicapping among European sportsbooks. BetVictor can offer years of experience in this type of betting.